The 13.3” EUROCOM M3 is now available with a Trusted Platform Module 1.2 for added security from external software attacks and physical theft. The M3 is a small form factor, high performance notebook designed for both professional and gaming use, it is the highest performing 13.3" notebook currently available on the market that is perfect for users that require a highly capable system that can easily fit in carry-on luggage a backpack or purse. The EUROCOM M3 custom built, high performance laptop is ideally suited for professionals who require an extremely small and mobile notebook with performance that belies its small size. With support for Intel Core i7 processors, up to the extreme edition i7-4930MX and NVIDIA GeForce GTX 765M graphics, 16 GB DDR3-1600 memory and support for up to 2.5 TB of storage in a 1.2 inch/3 cm thin, 4.4 pound/2 kg notebook. The M3 can be customized and upgraded based on the processor, memory, storage, display and wireless technology to allow customers to build the exact system they want with no need to pay for anything they don’t. The TPM 1.2 chip from Infineon Technologies ensures that information such as passwords, keys and digital certificates stored are made more secure. The increased security, brought on by the TPM 1.2 can save organizations in IT management costs. With the handful of keys it stores, all cryptographic functions are performed on the TPM chip. Security of the system is based on the protection and secrecy of the cryptographic system, especially against reading out or manipulation of the key material. TPM provides the ability for a computing system to run applications more secured, allows secured remote access, performed electronic transactions and communication more safely. Weighing just two kilograms and being only 1.2 inches thin makes the EUROCOM M3 extremely easy to carry around, with no need for a power cord due to the 300 minutes (5 hours) of battery life thanks to the 62.16 WH battery pack. Powered by a full line of upgradeable, socket based 4th Generation Intel Core i5, i7 and i7 Extreme processors on the Intel HM87 Express Chipset including the Intel Core i7-4930MX with 4 cores and 8 threads running at 3 GHz with 8 MB L3 cache, Intel Core i7-4900MQ, Intel Core i7-4800MQ and Intel Core i7-4700MQ. The M3 is the ultimate mobile machine with enough power to play the most demanding games or run multiple virtual machines and the portable size to take just about anywhere, with ease. Virtualization increases your computer systems efficiency while increasing the value and capabilities of your investment by allowing multiple operating systems, applications to run simultaneously on a single computing system. The EUROCOM M3 takes virtualization one step further by being very mobile. At the heart of the M3, users have an NVIDIA GeForce GTX 765M to do their work and play with 2 GB DDR5 memory running at 1000 MHz and 768 CUDA Cores running at 850 MHz. With support for Optimus 2.0 technology users get graphics performance when you want it and 5 hours long battery life when you don't. The M3 is equipped with a crystal clear 13.3” full HD 1920x1080 IPS display to take advantage of the pixel processing power of the NVIDIA GeForce GTX 765M. With 178 degree viewing angles and 700:1 contrast ratio this gorgeous high pixel density display will blow you away. Eurocom offers custom display calibration services to ensure the colours are perfectly true to life right out of the box. Users will be able to carry the M3 to battle with all the SATA 3 (6 Gb/s) data they need, with two mSATA storage devices and one standard storage drive for a total of 2.5 TB of storage with RAID capability. The M3 offers the ultimate in SATA 3 storage performance and redundancy. Customers have the option to configure the M3 with consumer grade drives all the way to enterprise class drives with the best in performance, redundancy and reliability with the added benefit of easily being able to add or change storage drives. Up to 16 GB DDR3-1600 SODIMM memory is supported via two slots with 8 GB modules that are easy access to upgrade or replace. Single 16 GB modules will be available in 2014 for up to 32 GB. Customers can choose a variety of operating systems from Windows 8 Home, Professional or Ultimate as well as Windows 7 Professional, Home and Ultimate with support for Linux operating systems as well. 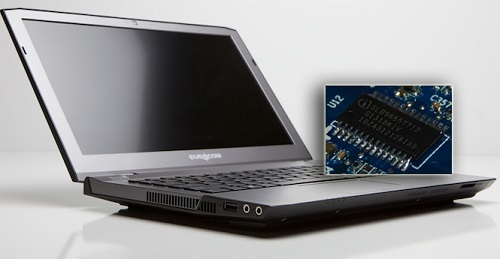 A wide range of connectivity and expansion technologies are supported, such as USB 3.0, eSATA, HDMI 1.4a, Display Port 1.2, DVI-I and a 9 in 1 media card reader, in addition to several others. The expandability of the M3 allows it to accommodate additions to its capacity and capability. Professionals can expect consistent, reliable connectivity via the M3’s optional Intel N-7260 802ac wireless LAN, Bluetooth 4.0 and RJ 45 ethernet port. Intel Dual Band Wireless-AC 7260 has a 2x2 antenna setup and supports 2.4 GHz and 5 GHz bands, delivering 300Mbit for 802.11n and 867 Mbits for 802.11ac networks. The 802.11ac uses 80 MHz channels, while 802.11n uses 20 MHz or 40 MHz. Intel Dual Band Wireless-AC 7260 comes with Bluetooth 4.0 support as well.